My favourite burger in terms of cost/quality ratio, hands down, is In-N-Out Burger. Sadly, the closest location resides in Redding, California. Talk about a drive for some burgers! What makes it so good? Quite simple actually. 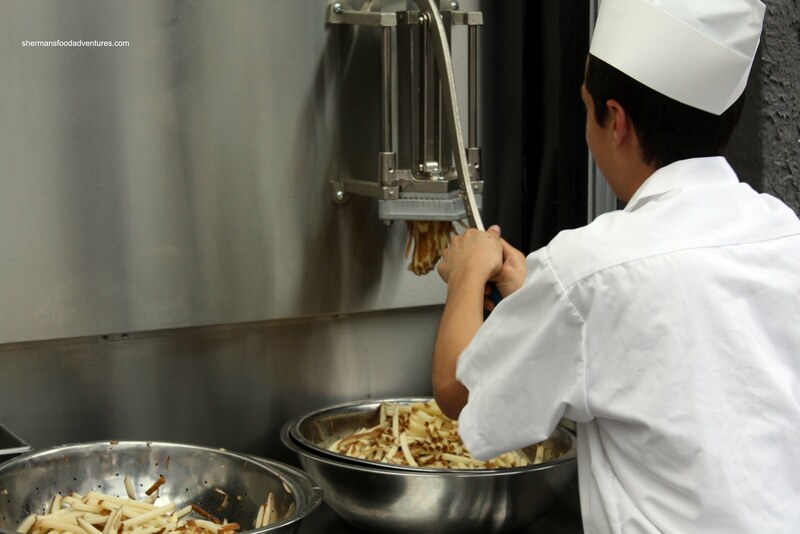 Fresh ingredients, including fresh patties and freshly cut fries to order, at a very reasonable price. For a fast food chain, they have got the formula down right. There is nothing remotely close to that in Vancouver. Well, Five Guys just opened up in West Van and that could possibly be somewhat close. 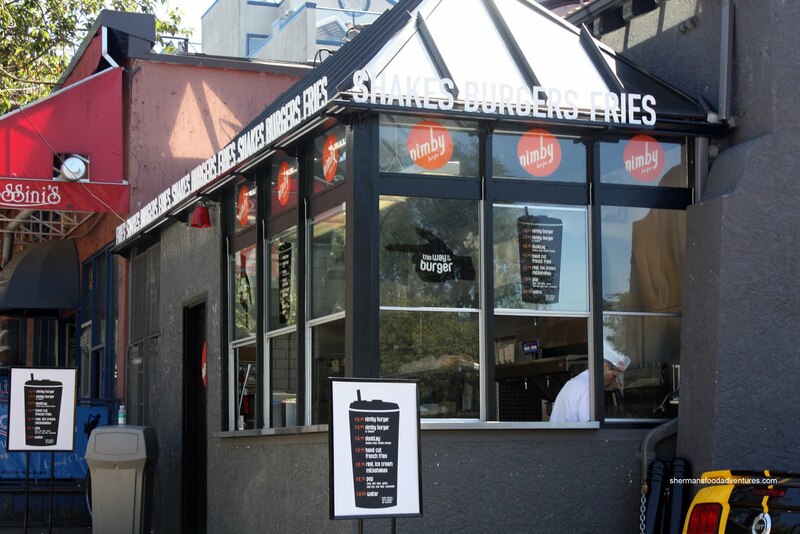 Now another In-N-Out wannabe begins to open up shop for real on Friday, May 21st. Located in the former beer storage room of now the defunct Malone's (now Local Public Eatery) comes Nimby Burger. A venture by the good people at Joey Restaurants, they try to use the same formula as In-n-Out. I was planning to check the place out on its grand opening date; but I was a little impatient. When I discovered that they were doing test runs all week, I though that it would be a great opportunity for me to give it go. But it seemed that their operating times were very random. While getting a haircut prior to my softball game, I noticed a tweet that they were doing more tests at that very moment. Once my haircut was done, I hightailed it outta there and made my way to Kits. Located near the corner of Yew and Cornwall, you will easily miss it since it's an extremely small outfit. However, you won't miss the abundance of staff in their ultra-clean white unis with a big Nimby Burger logo on the front. I parked the car and headed over. I decided on the Dooblay, Fries and a Diet Coke (yah, to somewhat temper the guilt...). How much did it cost me? Nada. It's free during their test week up until their grand opening on May 21st! Score! Most people waiting for their food were quite happy with that fact. Great PR move in my books. While I was waiting, I noticed that they were cutting their fries as orders came in. They were testing out Russet potatoes after trying out Yukon Gold the week prior. As with some other fast food restaurants, the prep counter is temperature-controlled to keep the burgers warm while being dressed. It was really too bad that the milkshake machine was not up, so I didn't get to try it. So what about the burger? Well, a Dooblay is essentially a double cheeseburger with lettuce, tomato and pickles. Other than that, only other choices are a hamburger and cheeseburger. They keep it simple here, just like In-N-Out. Now, if you look at the picture, the burger is served exactly like In-N-Out. But how does it compare? Well, it was pretty good. 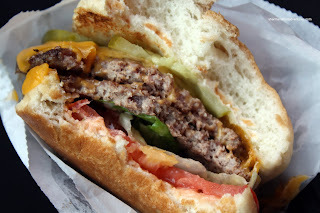 I like the toasted bun, it was soft, yet dense enough to hold everything together. I thought the beef was cooked up nicely without being dry. It wasn't super juicy; but for it's thickness, that wouldn't be possible anyways. 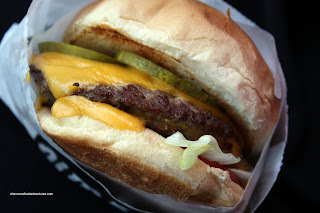 With plenty of cheese and fresh crisp veggies (pickles were good), the burger was a pleasant eat. It's hard to compare with In-n-Out since I have n't had one for over half a year; yet, I can't deny that this one was good. On my original visit, the "test" fries were terrible. 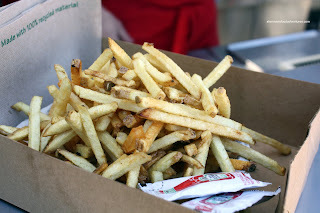 However on a random visit (albeit they treated me to the fries), the fries improved immensely. Now using Kennebec potatoes, they are crispy, light and well-salted. These are now comparable with those at In-N-Out. As I was there on a sunny weekend afternoon, they were doing brisk business. With a killer location and a relatively reasonable price tag for the area, Nimby should do pretty well. Nothing wrong with a free hamburger! Just from the pictures I love the look and vibe of the shop. Hopefully they get there fries in order. Chris, I think you got it right. It does have a good vibe and an outstanding location, right across the street from the beach. I can see this place being very successful in the summer months. However, as you said too, the fries need to get better... fast. Kim, we should just keep one-upping each other. LOL... Yes, you really should visit it. In fact, do it this week, you'll get your order for free. Just watch for their tweets. I went there at 6:00pm and they were up and running. Yah, I've heard the same things about 5 Guys, so when you did your post, I wasn't surprised. I gotta still go there myself! burgers and were mightily impressed. The line for ordering was down the block and this was in the middle of the afternoon. 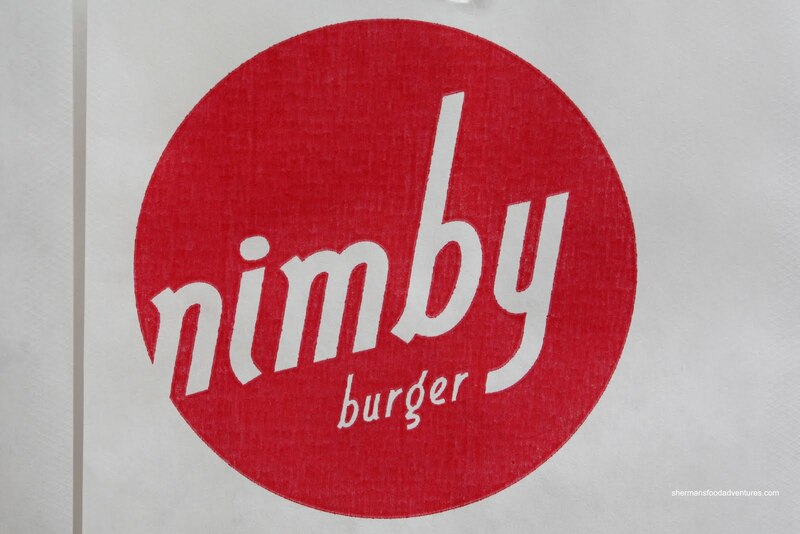 I'll definitely have to give Nimby's a try but the fries have to be really good or the one time could be it. I love my french fries! Claire, then I suggest you don't try the fries for now. They are not good. Maybe once they're open for a few weeks. Cuz you'll be disappointed. I kind of expected the patties to be thicker...damnit I was supposed to try one on Tuesday...but I was so full already...well when did that ever stop me lol? The fries don't look so great...but I'm surprised they were limp and oily...they look almost over fried so I thought they'd be crisp. Well, they weren't crisp, but then again, these were "test" fries. I've heard that they are better now. I didn't score a free one, but you have to admit that $2.49 is not a lot to pay for a burger. While it is better than McD's. I can't comment as to whether it is better than Inn N Out's as I have yet to try one. The closest to this for me would be BK. The fries were not oily, but they were quite 'white'. It was crispy when hot, but not so much when I ate it about half an hour later. It seems to cater to the surfer crowd. I don't think I would make a special trip all the way across town for it, but it would be a cheap meal if I happen to be in the area.